We know already from task #7 that we need to store the photos using Core Data. You must use UIManagedDocument to store all of your Core Data information. In other words, you cannot use the NSManagedObjectContext-creating code from the demo. The fact that the UIManagedDocument opens/creates asynchronously has ramifications for your entire application design since its NSManagedObjectContext may not be ready the instant your application’s UI appears. Design your code as if it might take 10 seconds or more to open/create the document (meanwhile your UI is up, but empty, which is fine). It never will actually take that long, but your code should work if it did. 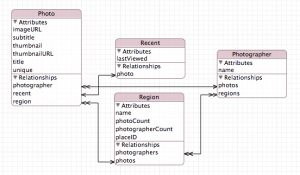 Your schema needs to support the specific needs of your application. When you add a photo to the database, feel free to set attributes in Entities other than your Photo entity which can support the querying/sorting you need to do. For example, you’ll likely want track directly the photographers who are active in a place or region (rather than relying on figuring it out from the photos all the time). Add four entities to hold data about photos, photographers, regions, and recently selected photos. For the photos we need string attributes to hold an unique identifier, a title and a subtitle, an image URL, and (because we peeked into future tasks) another one for the thumbnail URL as well as a data attribute for the thumbnail. A photographer can have multiple photos, thus add a many-to-one relation ship. A region will also have multiple photos, add another many-to-one relation ship. Finally add a one-to-one relationship to recent-photos entity. The photographer entity needs a single string attribute to hold the name of the photographer. Because there will be multiple photographers for a region, and a photographer might have photos for multiple regions, add a many-to-many relationship. The region needs two string attributes for its name and place ID. With the proper schema, this entire application can be built with very straightforward sort descriptors and predicates. Put your brainpower into designing the right schema rather than building complicated predicates. With the right schema, you should not need advanced KVC querying like @count. It’s perfectly fine to add an attribute to any entity that keeps track of a count of objects in a relationship if you want. Add two integer attributes to store the numbers of photos and photographers for the region. The recent entity gets a single date attribute. Note that we use a method of the Photo class. Every time the class files are created everything you change in those files will be lost. Therefore you need to use categories to extend those classes (Create a category using File -> New -> File… -> Objective-C category. Because the photo class needs additional Flickr functionality, name the category Flickr, which should result in two new files Photo+Flickr.h/.m). Like before check first if the photographer already exists, create him/her and populate his/her attributes. The dh: sharedDocumentHelper instance will be initialized only once? because you use dispatch_once? static dispatch_once_t pred = 0; What’s the consequence if we don’t do this assignment? if preparingDocument has been set to NO, it means another processing is already accessing the document. And we return result = NO, preparingDocument = YES. Then we delay DOCUMENT_NOT_READY_RETRY_TIMEOUT, reaccess to this document. This time we can access to it, because preparingDocument is YES. Provided that preparingDocument = YES, two process want to access to this document at almost the same time. process A arrived a little bit earlier, so he succeeded in accessing this document. But what if the process B arrive at the time before process A setting preparingDocument to NO? Is it possible? The predicate is used to test whether the block has completed or not. I guess not setting it would initialize it to 0 anyway. OK, Thank you, I understand :D. Your preparingDocument is a valve. If a process is accessing to the document, its value is always YES, That means we close this valve until this process finish its access. That’s so cool! the Region entity until now stores the placeID, the number of photos for each placeID, the photographer and the number of photographers who took photo for each placeID. Sorry, I should have been more clear. Your Region entity here stores placeID, so region.name have not been extracted yet. Can I understand this method this way? “useDocumentWithOperation” is the parent method of “operation” which has two argument “document” and “success”. And the class method “+ (void)useDocumentWithOperation:(void (^)(UIManagedDocument *document, BOOL success))operation” is used to initialize a singleton instance of “DocumentHelper” dh, so finally there can be only one “DocumentHelper ” instance which is dh.